The contract for a short-term holiday rental will be between Lavender Hill Holidays Limited (referred to as "us" or "we" ) and the person making the booking and all members of the holiday party (referred to as "you" or "your") in the following booking conditions, the law of England and Wales will govern the Contract. The contract of hire is not effective until we have received the deposit. The contract will be subject to these booking conditions, and must be complied with. The party leader must be at least 18 years of age at the time of the booking and the booking form must list names, addresses and ages of your party. You should not arrive before 4pm on the commencement date, and leave by 10am on the day of departure. Failure to do so will result in you being charges a further day's rental. You must not use the property except for the purpose of a holiday during the holiday period, and not for any other purpose or longer period. The agreement to stay in the property for the holiday period, does not create the relationship of Landlord and Tennant between the parties. You shall not be entitled to a new tenancy, or to any assured short hold or assured tenancy or any statutory protection under the Housing Act 1988 or other statutory security of tenure now or at the end of the Holiday Period. Whilst we are prepared to consider requests for reservations of the properties, the confirmation of a reservation shall not render us liable in the event that the property is unavailable for occupation during the period reserved and no contract will arise between us and you otherwise than in accordance with the following provisions of these terms and conditions. If the booking form is submitted less than 12 weeks before the commencement of the requested holiday period - the full amount payable in respect of the whole of the letting period. In the event that we decline an application, the full amount of the booking fee will be refunded to you. In the event that an application is accepted, the booking fee will be retained by us and treated as a payment on account of the amount payable in respect of the letting. The contract between us and you for the letting of the property shall arise upon us giving written confirmation of acceptance of your application (which at our discretion may be dispatched by prepaid post or electronically to any email address provided by you in the booking form) or upon us having obtained clear funds in respect of the application fee whichever is the later. In a booking to which 4ii applies, upon our acceptance under clause 5. Non-payment of the sum payable under clause 6 by the due date may be treated as a cancellation of your booking and we will be entitled to re-let the property without reference to the client. The terms as to payment in clause 8 thereafter apply. ALL APPLICANTS ARE ADVISED TO TAKE OUT PERSONAL HOLIDAY CANCELLATION INSURANCE. Any request to cancel a booking must be made to writing to us. You shall remain liable for all the payments due in respect of the reservation whether or not they have been paid at the time of the cancellation. We will use our reasonable endevours to re-let the property in respect of the cancellation period. If we are successful you will be refunded the difference between moneys you have paid less the sums receivable from the re-letting after deduction of all costs and expenses incurred by us which shall include an administration fee of £20 in respect of each day that the property was reserved by you. We reserve the right to amend the price quoted in a brochure or rates sheet due to errors or omissions or changes in the VAT rate. In such circumstances we will contact you as soon as we become aware of an increase in charges. If you do not wish to pay the increase you shall be entitled to cancel the reservation and receive a full refund for all monies paid in respect of the reservation providing notice of cancellation is given in accordance with the provisions of clause 4 and within 7 days of you receiving notice of the amendment to the price to be charged from us. We will consider any request to change dates or cottage choice after confirmation has been issued. We reserve the right to charge an administration fee of £30 plus VAT in the event a change of booking is made. Under no circumstances may more than the maximum number of persons stated in the brochure and the web site occupy the property . We reserve the right to refuse admittance if this condition is not observed. Any persons other than members of your party must not use the facilities of Lavender Hill Holidays Limited. You are responsible for the property and are expected to take all reasonable care of its furniture, pictures, fittings and effects, in or on the property. You must leave them in the same state of repair, and in the same clean and tidy condition at the end of the rental period as at the beginning. You must not use the properties for any dangerous, offensive, noxious, noisy, immoral activities or carry on there any act that may be a nuisance or annoyance to the owner or other neighbouring properties. Smoking is not allowed in any of the properties or in any communal areas. To self cater, or to book catering with a recommended caterer. Bookings of Lavender Barn require a damage deposit of £250.00. You will be required to make this payment by either cash cheque bank transfer or card before your arrival at your accommodation. This amount is fully refundable providing the property is left clean and tidy, that there have been no breakages, extra cleaning required, any extra people found to be staying at the property or any disturbance caused to other guests or neighbours. In the event that you or anyone staying at the property during your reservation period causes damage or incurs a need for professional cleaning services or leaves the property without settling invoices for additional services or supplies received during your reservation period you will be notified in writing of the details of any extra costs incurred within 10 working days after the end of the reservation period and this amount shall be deducted from the Damage Deposit, if one has been taken, or payment will be required by you. Guests staying at Lavender Barn have access to the pool between the hours of 0830 and 2030, whilst guests staying at Cornflower Cottage, The Treehouse and Cherry Tree Farmhouse have access to the pool between the hours of 1200 and 2030. (For the avoidance of doubt guests staying at Broadwood Farm and Railway Cottage do not have access to a swimming pool). You agree that the use of the swimming pool facility and spa equipment is at your (or any third party residing in the property during the period of your reservation) risk in all respects. You agree to observe the "Regulations and Conditions Governing the Use of Swimming Pool, Spa and Ancillary Equipment" which form part of these Conditions and to ensure that any third party residing in the property during the period of your reservation also abides by the same. The number of persons within the party shall not exceed the maximum number of persons permitted to occupy the property. Any breach of these provisions will constitute a breach of contract, thereupon we may terminate the booking forthwith in which event all moneys paid by you will be forfeited and you may be required to vacate the property. We reserve the right to repossess the property at any time where damage or nuisance have been caused by you or any member of your party and in such event we shall not be liable to make any refund whatsoever. This condition 17 sets out our entire financial liability (including any liability for the acts or omissions of its employees, agents, consultants and subcontractors) to you in respect of any breach of this agreement; any use made by you or any third party residing or maiking use of the property during your period of reservation and any representation, statement or tortious act or omission (including negligence) arising under or in connection with this agreement. All warranties, conditions and other terms implied by statute or common law are, to the fullest extent permitted by law, excluded from this agreement. Nothing in this agreement limits or excludes the liability of us for death or personal injury resulting from negligence or liability incurred by you as a result of fraud or fraudulent misrepresentation by us. We shall not be liable for loss of profits; loss of business; loss of anticipated savings; loss of personal property or possessions; loss of use of the property or any special, indirect, consequential or pure economic loss, costs, damages, charges or expenses in respect of the reservation. Our total liability in contract, tort (including negligence or breach of statutory duty), misrepresentation, restitution or otherwise arising in connection with the performance or contemplated performance of the conditions of this agreement shall be limited to the monies paid in respect of your reservation under the conditions of this agreement. Any vehicle of yours or any third party making use of the property during the period of your reservation is left at the property entirely at the risk of the owner of the vehicle. In these terms and conditions "Force Majeure" means any circumstances beyond our reasonable control including, without limitation, an Act of God, Fire, Flood, War or Acts of Terrorism. If by reason of Force Majeure the property is not available at the commencement of the time booked by you or the property is unsuitable for letting at that time, we shall not be deemed to be in breach of contract but shall refund in full to you all fees, charges and any deposit paid in advance by you. We will not be liable for any other claim for loss or damage by you. (a) In the event of any conflict between these booking conditions and any other contents of any brochure or website, these conditions shall prevail. (b) These terms and the contract between you and us shall be subject to and interpreted in accordance with the law of England and Wales and the courts of England and Wales shall have exclusive jurisdiction to hear any claim arising from such contract. (c) Words herein denoting the masculine gender shall, where the context so admits be taken to include the feminine and neuter genders and vice versa. (d) Words herein denoting the singular shall, where the context so admits be taken to include the plural and vice versa. WE REQUIRE THAT OUR GUESTS READ AND SIGN THE FOLLOWING CONDITIONS WHICH SHOULD BE READ IN CONJUCTION WITH AND FORM PART OF THE BOOKING CONDITIONS. To make sure the cover is always replaced after use to retain the heat. To note the cover must be completely removed and that it is dangerous to be in the water with the cover on or partially on. 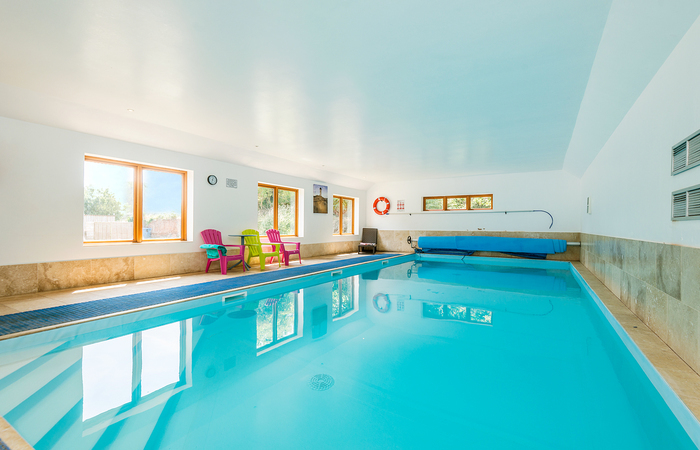 Guests should note the pool has a constant depth of 1.2-1.3m therefore diving is strictly prohibited. To ensure that children under 18, or any novice swimmer of any age, are always supervised by an adult and confident swimmer at all times. Your holiday or that of any third party residing or making use of the property during the period of your reservation in breach of this clause may be terminated immediately and without Compensation or any further obligation. Any damage to pool facilities arising out of misuse or as a result of negligence and/or failure to follow the instructions herein will be chargeable to you. To use the pool spa or play equipment at their own risk. Not to alter or tamper with pool equipment. BEFORE YOUR ARRIVAL if you do not wish to use the hot tub facilities within your cottage, please let us know, and we will set the hot tub accordingly. Guests wishing to enjoy the hot tub are required to read this disclaimer and agree to the following information. PLEASE NOTE: As the lead guest, and signatory for this booking, you are responsible for ALL the people staying at the cottage with you during your stay being aware and agreeing to this information. A copy of the rules will be available in your cottage guest welcome folder or mounted on the wall. The signatory is responsible for making sure that all members of their party, and their guests, are aware of, and strictly adhere to the guidelines for proper use of the hot tub. •Lavender Hill Holidays Limited take no responsibility for any accident, injury or health issue resulting from the use of the hot tub. • The hot tub must never be switched off at the mains. Only authorised maintenance personnel are authorised to control the mains power. There may be an extra charge added to your bill if the tub is switched off during your stay – even if you are not using it. • Hot tub cleanliness is paramount. For your own safety it is essential that the water is kept clean as failure to do so results in the water balance changing which seriously diminishes the effectiveness of the sanitising chemicals. Our authorised maintenance personnel will check the chemical balance of the hot tub regularly to monitor the levels of sanitizer and to check the water balance and quality. Water balance/chemicals will be adjusted as necessary and results recorded. This procedure is a safety requirement for hot tubs in holiday properties and ensures that the chemical balance of the water remains continuously safe for your enjoyment throughout your stay. • If upon inspection the hot tub is found to be dirty due to misuse, it may be necessary to for us to empty the hot tub and switch it off. We reserve the right to turn the hot tub off for the remainder of your stay. If you wish to have the hot tub cleaned and refilled, this will incur an additional cost of £75. Please be aware that it can take up to 24 hours for the tub to reheat. • Only guests whose names have been provided on your booking are permitted to use your hot tub. • People with infectious diseases should not use the hot tub. • The use of alcohol, drugs or medication before or during use of the hot tub is forbidden and could lead to drowning. • People on medication should always consult their doctor before using the tub. • People who are pregnant, obese, have heart conditions; blood pressure problems, circulatory problems, skin conditions or diabetes should always consult their doctor before using the tub. • Do not use the tub immediately after strenuous exercise. • Limit your soak to 20 minutes, and cool off before re-entry. Prolonged use of the hot tub can lead to hyperthermia. This is a dangerous condition when the internal body temperature exceeds 37 degrees. Symptoms may include failure to perceive impending hazard, failure to perceive heat, failure to recognise need to leave the tub, unconsciousness and drowning. • Do not open the electrical box of the hot tub. • Do not allow any pets in the hot tub. • NEVER leave one person alone in the tub or let them sleep in it. This could lead drowning. Please treat the tub as if it were your own as maintenance is expensive. • Do not drink the water, or allow the water to enter your mouth. • NEVER allow children under 7 in the hot tub. Children under 16 must have a responsible adult present at all times. • In the interest of the peace and quiet for other guests staying on site the hot tub cannot be used past 10pm. Please take care in removing and replacing the lid, the lid must always be replaced after use and removed totally when in use. Be careful when replacing the lid not to introduce grass and mud to the hot tub. We require that our guests read and sign the following conditions which should be read in conjunction with and form part of the booking conditions. 2 dogs per booking at a cost of £25 per dog per booking. Not to allow any pet upstairs or in downstairs bedrooms. Never to leave any pet unattended in the property or garden. Not to allow any pet in the swimming pool area. Not to allow any pet on the furniture. To bring all pet bedding required and towels for drying the pet when required. To ensure that any pet is clean and dry before allowing inside the property. To ensure that pets behave in such a manner as not to disrupt the enjoyment of other people staying in the vicinity or prejudice the reputation of the owner of the property. To pick up all dog mess from the garden. We treat any data collected during the course of making bookings or dealing with enquiries in strict confidence. Your data will never be sold. As members of Premier Cottages (a marketing collective of the best four and five star cottages in the UK) we have agreed to supply to Premier Cottages Ltd the names, postal and email addresses of all guests booking with us during the previous year, in order that these guests may be sent a Premier Cottages brochure and sent promotional emails from time to time. By accepting these terms and conditions you are indicating your consent to receiving these communications unless you let us know otherwise. If at any time you would like your details removed from this list all you need do is click the unsubscribe link on any of the emails or contactkate@lavenderhillholidays.co.uk and we will arrange for you to be removed from our database. 1.1 We do not recommend in particular the use of any websites (or other internet related services) ("Internet Services") and your use of Internet Services is carried out entirely at your own risk. 1.2 We have no responsibility for, or control over, the Internet Services you access and do not guarantee that any services are error or virus free. 1.3 We have no responsibility for, or control over, the information you transmit or receive via the Service. 1.5.3 that the Service will be compatible with your equipment or any software which you use. 1.6 [Whilst we take reasonable steps to ensure the security of the Service and to prevent unlawful access to information transmitted or received using the Service] we do not guarantee the security of the information which you may transmit or receive using the Service or located on any equipment utilising the Service and you accept that it is your responsibility to protect your information and have adequate security (in terms of equipment and procedures) to ensure the security, integrity and confidentiality of your information and data. 1.7 We reserve the right at all times to withdraw the Service, change the specifications or manner of use of the Service, to change access codes, usernames, passwords or other security information necessary to access the service. 1.8 The service is provided for the purpose of checking emails and surfing the web to aid with the enjoyment of your holiday, it is not provided for the purpose of downloading films or music of any sort. We reserve the right to charge for what we consider excessive use. 2.2 Music, video, pictures, text and other content on the internet are copyright works and you should not download, alter, e-mail or otherwise use such content unless certain that the owner of such works has authorised its use by you. 2.3 We may terminate or temporarily suspend the Service if we reasonably believe that you are in breach of any provisions of this agreement including but not limited to clauses 2.1 to 2.3 above. 2.4 We recommend that you do not use the service to transmit or receive any confidential information or data and should you choose to do so you do so at your own risk. 2.5 The Service is intended for consumer use only. In the event that you use the Service for commercial purposes we would specifically refer you to clause 5.2 below. 3.1 You must not use the Service to engage in any activity which constitutes or is capable of constituting a criminal offence, either in the United Kingdom or in any state throughout the world. 3.2 You agree and acknowledge that we may be required to provide assistance and information to law enforcement, governmental agencies and other authorities. 3.4 You further agree we are entitled to co-operate with law enforcement authorities and rightsholders in the investigation of any suspected or alleged illegal activity by you which may include, but is not limited to, disclosure of such information as we have (whether pursuant to clause 3.3 or otherwise), and are entitled to provide by law, to law enforcement authorities or rights-holders. 5.1 You agree to compensate us fully for any claims or legal action made or threatened against us by someone else because you have used the service in breach of these terms and conditions, and in particular clause 2.1 to 2.3 and 3.1 above. 5.2 Whilst we do not seek to limit our responsibility for fraudulent misrepresentation or if you are injured or die as a result of our negligence we have no responsibility (to the extent permitted by law) to compensate you (whether or not we are negligent) for any direct financial loss, loss of profit, revenue, time, anticipated savings or profit or revenue, opportunity, data, use, business, wasted expenditure, business interruption, loss arising from disclosure of confidential information, loss arising from or in connection with use of the service or inability to use or access the service or a failure, suspension or withdrawal of all or part of the service at any time or damage to physical property or for any other similar direct loss that may arise in relation to this agreement whether or not we were advised in advance of the possibility of such loss or damage. 5.3 We agree that neither this agreement does not allow either party to act as, or hold themselves out as, acting as an agent of the other party and that that the terms of this agreement are not enforceable by a third party under the Contracts (Rights of Third Parties) Act 1999. 5.4 This agreement is governed by the law of England and Wales and is subject to the non-exclusive jurisdiction of the English courts. Please be forewarned that it is possible to catch computer viruses by accessing a web page or by downloading or running an infected program. Whilst Lavender Hill Holidays Limited has taken steps to ensure that the pages on this web site are free from infection, such is the nature of the Internet that no assurance can be given that the pages of this web site are indeed free from infection. It is a condition of us allowing you free access that Lavender Hill Holidays Limited will not be liable for any loss or damage suffered by any person accessing this web site or any third party resulting directly from the transmission of a computer virus resulting from the accessing of this web site. The contents of the pages on this web site are copyright Lavender Hill Holidays Limited. The copying or incorporation into any other work or part or all of the material available on this web site in any form is prohibited save that you may: download extracts of the material on the site for your personal use; or: copy the material on the site for the purpose of sending to individual third parties for their personal information provided that you acknowledge us as the source of the material and that you inform the third party that these conditions apply to them and that they must comply with them.